A very light shower started the day, but not enough to make a raincoat a necessity, and it cleared up quickly with the day gradually getting finer and warmer. More track clearing was done between Seagers Lookout junction and the top of the climb to the high point before Windy Moor. Also, some of the Bauera on the Seagers track was cut but we discovered more needs doing there. Our priority section of track has already been hardened with rock and areas of lesser concern are now being targeted. 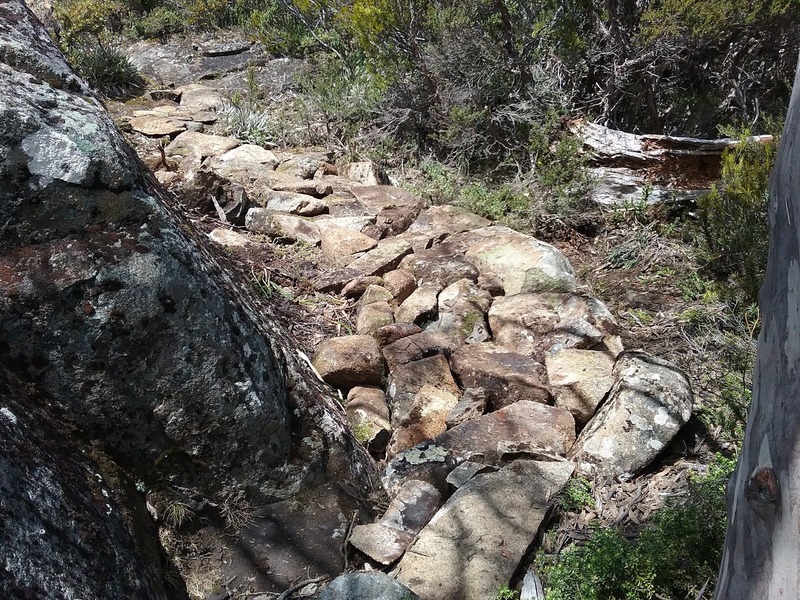 Two short boggy areas were given the rock treatment and it was fortunate that both had a good supply close at hand. In addition, a scree on a slope was made much better to negotiate by moving rocks into positions to make stepping up and down easier.